New Technology: Should We Embrace It? When I started to go to school in the 1940s, students were taught to write with steel nib pens using ink from inkwells that sat on each school desk. Learning to write with an ink pen was a laborious business. One had to learn penmanship and to write without blotting or smearing one’s work. It was very strictly taught but it was much of a disaster for a naturally sloppy person like myself. The only diversion was when there was a girl with pigtails sitting in front of me (use your imagination!) Ball point pens started to come into common use in the mid 1940s, however the school system resisted their introduction for years- the argument being that, by using this new technology, the students would lose the finer arts of penmanship. Imagine: putting words on paper without having to worry about smudging or blotting! Needless to say, ballpoint pens began to be accepted after a few years and have been in use ever since. Penmanship has suffered but our ability for written communication has greatly improved. Television was another example of new technology. In the 60’s, the use of TVs expanded exponentially. In our family, we did not get a TV for years because of the banal programming. It was better to read books. However, we found that our two boys were spending more time at friend’s houses, not socializing, but watching cartoons. We had to bow to the inevitable and get a TV, but with controlled watching hours and programming. There have been similar breakthroughs with communication and learning in the past. From the around 6th to the 19th century, writing was generally done with a quill pen. When the steel nib pen was introduced in the mid 19th century, there was a fear that we would forget how to carve our own quills from goose feathers! Also, think of the invention of the printing press; new technology putting thousands of monks out of work! We have now been presented with more new methods of communication and learning: computers, tablets, smart phones etc. There have been some arguments that preschoolers should be kept away from this technology until they are older; others that we should introduce these children to it as soon as possible because it is the way that their world is going. The fear on both sides seems to be that the children will find these new ways of communicating and learning to be too mesmerizing and time wasting by mindlessly watching cartoons (some with commercial content), gaming and spending too much time on Facebook etc. These fears are valid but can be dealt with by the proper introduction of this technology to our preschoolers. Who better to do this than librarians? Will this technology last? Will it fade away and will we go back to “traditional” forms of learning and communications? If parents think so then, by all means, restrict children’s usage of it and recognize it as a passing fancy. However, if you think that it is and will be part of our and their new world, then it will be best for our children to learn how to use it responsibly early in their life, to be able to use it as a learning experience, to be able to distinguish between entertainment, learning and manipulation (such as product placement) and, most important, to be able to distinguish between the digital world and real life. Once children start school, they will be exposed to computers. For preschoolers, the best place to learn how to cope with this new technology is through your local library with tech savvy librarians. So, take your children to your local library, make use of its preschool programs and give your preschool children a proper introduction to the digital world. 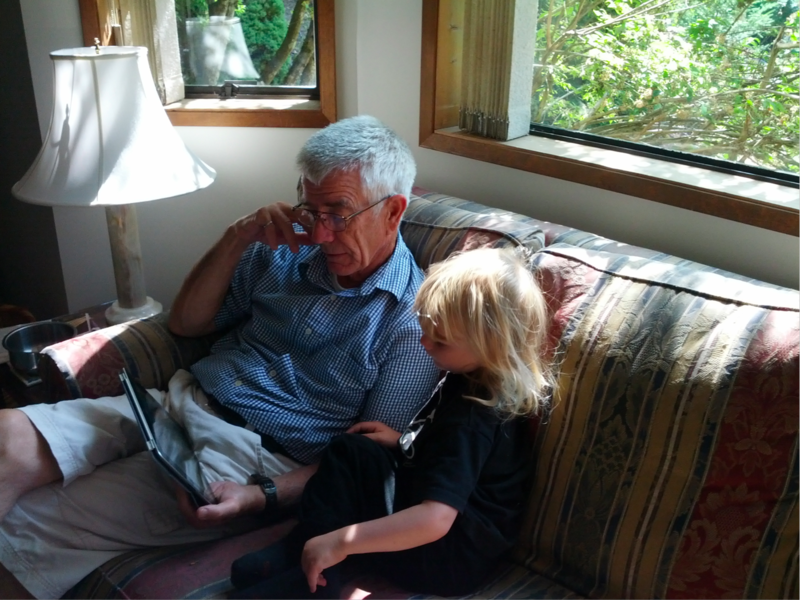 Ed Campbell (Cen’s Dad) was born in 1938 and thus saw the transition from ink pens to iPads. He started his working life as a logger on the west coast then as a miner in Northern Manitoba. After deciding that this was not the life for him, he married the lovely Roberta, finished university, became an engineer, had four children and ended his engineering career as an advisor to (South) Korea Electric on their CANDU nuclear power plant program. Roberta and Ed now live on Vancouver Island and enjoy reading to the grandchildren, paddling kayaks, hiking, chopping firewood and learning how to survive in the digital age. Posted on October 23, 2013, in Literacy. Bookmark the permalink. 1 Comment.